Do you want to present your company at the largest exhibition in the Middle East? Register now through enclosed registration form! Participate in the Holland Pavilion and present yourself to a large audience at the Arab Health 2019 from 28 – 31 January 2019 in Dubai! The Arab Health attracts as many as 84.000 visitors and 4100 exhibitors from all over the world. 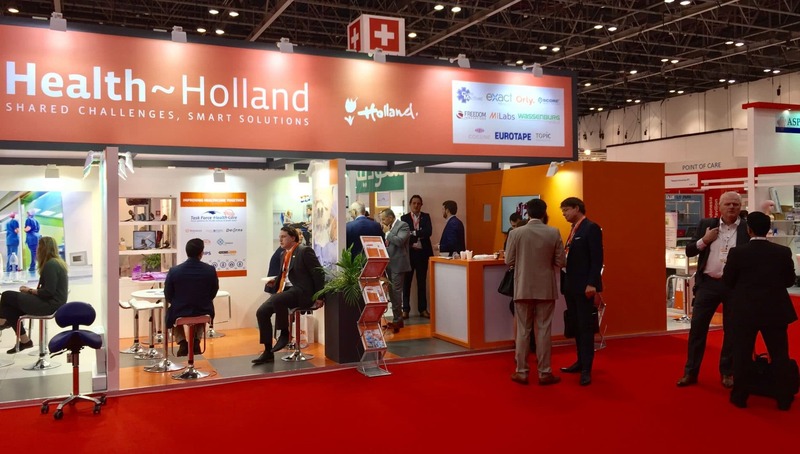 At the large and busy Arab Health, the Holland Pavilion offers you a unique and professional booth with excellent opportunities to exhibit your product and services and receive guests. This way, you are guaranteed to stand out from the crowd at this huge fair! Furthermore, we will take care of the majority of the preparations- and organisation process for you. Although we put great emphasis on a unified appearance, it is important to us that your company’s identity is retained within the Pavilion. All prices are excluding VAT, all travel expenses, transport and extra services in your individual booth. Participants will receive an invoice of 100% of the total costs of the application. Cancellation is not possible after registration and will be billed for 100% of the participation price. During the participants meeting there will be a presentation of the design of the Holland Pavilion and you will have the chance to meet your fellow exhibitors. The participants meeting will be held in the beginning of December. If you have any questions or remarks please contact me directly.